Should we repay more of our 2.6% HDB loan to save 0.1%? There is this question that keeps bugging me which I seldom go and explore. And I believe it bugs some of you as well. If you purchase a HDB flat unit and take out a HDB mortgage loan, should you periodically put in more to pay off your mortgage? The common answer I get, and a conclusion I came to myself is: CPF Ordinary Account currently pays 2.5% per annum. HDB Mortgage Loan interest is 2.6% per annum. By paying off the loan, you are saving 0.1% per year the number of years you need to service the loan . That does not look like a lot. Perhaps, it makes sense to drag it out longer. 0.1% shouldn’t make that big of a difference. Usually what I hear most Singaporeans do will be to take a 25 year mortgage. The longer the tenure the lower amount that they have to pay per month. Since there is no early lump sum additional repayment penalty, they have the flexibility to pay off if they improve their income stream later in their working years. The opportunity cost of paying $X more per month in repayment, is that this $X amount cannot earn the interest it is suppose to earn, in this case the 2.5% CPF OA rate. For the adventurous ones can also put their opportunity cost that the $X amount cannot be put into higher yielding wealth instruments such as insurance endowment, unit trust, gold , stocks and shares. The more you put into repayment, the shorter your mortgage tenure, the faster you free up this $X amount to do whatever you want it to. The more you put into repayment, the more interest you save over the years. The evaluation here would be how much savings in mortgage interest, versus the returns that a person can get by leaving it in CPF OA, or channeling it in higher yielding instrument over the duration of the mortgage loan. I don’t know why I arrive at this figure, but its a rather well rounded figure. I am a bit lazy here, so I make use of a trusty financial calculation app. Over 25 years, you will pay $108,303 in interest. So if you buy a $360,000 flat, and want to take a long time to pay, your cost price is not that but $468,303 + Renovation + Yearly Maintenance. If we pay off an extra $1000 per month, you will save $57,034 in interest and pay off 151 months earlier or 12.5 years earlier. That is a lot of money saved. Now imagine your opportunity cost is not sitting in CPF OA but in cash, that earns next to nothing. That $57k is like a return on investment in itself. 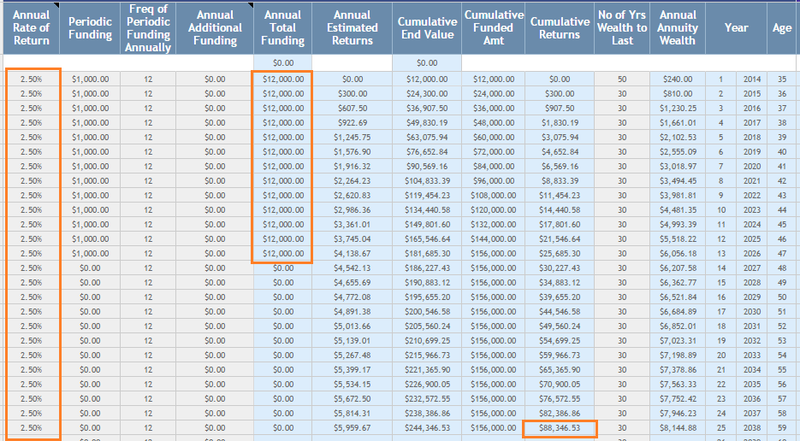 The opportunity cost in this case of not repaying more is that this $1000 per month or $12,000 per year can accumulate CPF OA interest of 2.5% for 12-13 years.From the table below, the cumulative returns from leaving in OA for 13 years is $25,685. That looks much less than $57k! The opportunity cost in this case of not repaying more is that this $1000/mth or $12,000/yr can accumulate in CPF OA at 2.5% interest for 25 years. From the table below, the opportunity cost is as if you contribute $12,000/yr for 13 years. For the next 12 years, there will not be contribution but there will be accrual interest, since you have already contribute and build up a base for 13 years. The cumulative returns at the end of 25 year is $88,346. This is much better than the $57,034 in savings. I was rather floored by the figures. I didn’t think the difference between 0.1% is going to be THAT big. So I decide to do it with a smaller amount of $300 per month. The interest savings are noticeably less at $27,282 and it gets paid off earlier by 70 months or 5.8 years. This means u need to service the mortgage loan for 19 years. The CPF OA opportunity cost of the $300 per month at the end of 25 years is $31,572. This is about $4000 more than if you paid off earlier. The alternative of leaving your funds in CPF OA, is to transfer the funds to your CPF SA, where you will earn 4% and 1% additional for your first $40,000 in your CPF SA. If you are savvy (or you think you are savvy), you can take the funds and purchase unit trust. If we take the repaying $300 more per month example, and instead of a 2.5% rate of return but a 4.5% rate of return, the returns at the end of 25 years is $67,853 compare to $27,282 if you paid off the loans faster in 19 years, as well as the returns of $31,572 if you left it in CPF OA. The conclusion I gather here is that all else being equal, it is better to put in more to pare down your mortgage and shorten the duration. The amount of the difference in opportunity depends very much on the amount you want to repay more. The more repayment, the shorter your mortgage duration, the bigger the difference. The first conclusion I met when I first published this post is that no matter what, based on monetary figures, it is better to pay off the loans faster. I realize that I didn’t factor in that the alternative of repaying faster is, we build up an asset that accrual interest even after repayment. And as such the returns even at $100/mth matches that of the interest savings. In most cases, the monetary comparison is better. The comparisons are done mainly with CPF OA funds but a person can easily use cash to pay down the loan. In the case of cash, it is a different conclusion because, you are not building up an asset that gives X% returns. Current cash yields very very low. For most folks, if their family members stick to fixed deposits, the better better monetary choice is to repay the loans faster. The interests saved and not paid will be like return on investments in this case. The difference is not 0.1% but 2.5++% in this case. This flexibility is great but my simulation can be said to be a little bit unrealistic in that, usually the repayment is lump sum. You save for a period and then you pare it down. As such your mileage may vary in the amount of difference between loan interest savings and CPF OA returns. You would have to work it out yourself. HDB loan like other debt holds different value to different people. Some people can stand having the weight of the debt while others cannot. Your perspective of it influences your decision. The stability of your job also matters as well. For that it is seldom a monetary only evaluation. 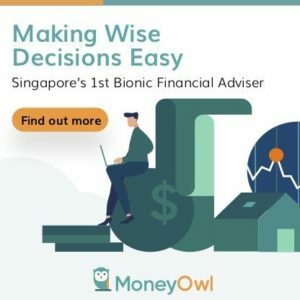 The alternative to CPF OA is to put in some wealth building instruments. The difference here versus putting more to paring down the loan is that the returns are less probable and that you have to take that into consideration. Even with this evidence, people would not want to pare down because even if they have saved much CPF money, they cannot take out the money. Because of that, they usually compartmentalize and take more risk with it, or not care so much about these little details. At the end of the day, they are not going to see this money. 2nd mortgage capped at LTV 60%. There is an increasing number of individuals confused about whether they can qualify for 80% LTV when they already own a property. This rule is for your 2nd mortgage, not 2nd property. So if your 1st private property is fully paid up, you can still qualify for 80% loan to value. What started out as a short exercise on a Saturday after noon became some thing more. I wonder if the majority of the readers friends and colleagues usually drag out their mortgage loans since the loan is considered safe and that they have no assess to CPF. I used to hold that train of thought but in recent years I realize the decision is not so simple as how much you saved, or how much you stand to gain. When you decide to live your life in a parameter different from others, your decision to pay off or not also will be different. The important thing here is that you go through a sound thought process and come to a good decision. I would like to thank some of my readers to point out some flaws in my early publication. It turns out that I might not be doing a good comparison in terms of time frame. That is the trouble we bloggers faced. We want to provide our perspective and help educate a bit, but sometimes we have our problems in evaluation and that could cause more harm then good. So I made the necessary correction. It’s been 2-3 yrs and I still can’t decide which is a better option to follow – dump the excess savings to repay back the loans or put it in the market to hopefully get enough returns to offset the loans. It’s not an easy question to answer. So far, my thinking is that I’ll do a little of both. Put some money back into the loan, to shorten the duration and reduce interest. At the same time, use the money and invest it for a passive income large enough to offset the loans. Put all into the loan, you run the risk of not having enough to pay even the monthly mortgage, should I lose my primary income. Put all into the market, we have a non-guaranteed returns trying to beat a guaranteed interest on the loan. Sucker deal. One day, both paths will converge and I can see how my situation fares and decide again. That’ll be 10-15 years from now. Things might change, it might not. Beats doing nothing, in my opinion. hi LP, something is wrong with my evaluation. a reader has point out to me. check back a bit. the decision is not so much monetary. its also about your connection to debt the emotion to it. You article is fundamentally flawed. U used the interest payable for 25 years. Yet compared it with interest earned for 13 years for the $1000 per month top-up example. Try calculating the 25 years of interest and you will see a small difference! I believe my comparison is correct. I did not use the interest payable over 25 years. In this case the interest payable over 25 years is almost $108k. What I am comparison is the spare CPF OA funds you have (suppose you earn that much!) to pay off faster, thus offsetting future interest payment. In this case it is the 52++k. The alternate use of the CPF OA funds alternatively earn 2.5%, or 4-5% if you transfer it to SA, or you put into stocks and shares for greater yield. Why i am using 13 years is that, if you pay off 1000/mth for 12.5 years, you already pay off your loans, so that is when the opportunity cost ends. A fairer comparison would be to consider topup $1000 per month into CPF ordinary account, stopped after 13 years. Then the accumulated interest till year 25. Lee has pointed out to me. i see where you are coming from. i realize i am comparing different time period. let me correct it. Agreed with Jimmy Lim. Alternatively, run the simulation using 2.5% as home loan interest rate and there should be zero difference between the two approach. I replied to Jimmy. you might want to take a look at it. thanks! Just to add, the difference is not in the amount of extra payment. It is the years you missed out in calculating acute interest (if money is leave it in CPF), for $1000 payment you account for only 13 years, for $300 account for 19 years, for $100 account for 23 years. Hi Lee, ah i see the flaw in my logic there. let me think about it i think you and jimmy is right! Actually, IMHO, the HDB loan rate of 2.6% is rubbish. One can actually explore the POSB/DBS home loan. The rate is lower for the next 8? years. Are we paying too much for a fixed rate loan over 25-30 years? the question is can we have that for HDB flat or is that for more private and EC based stuff. the 1% is like a 1% interest gain. bro, my computation a abit wrong. check back the post tonight. some facebook folks also told me that. But think about it, part of my example shows that you have to jack the 2.5% returns to 5% in the $1000/mth example for the savings to be equal. This means that you possibly have to transfer the funds to CPF SA ( first 40k at 5%) in order to break even. I think i will put in this point. Thanks for pointing out. 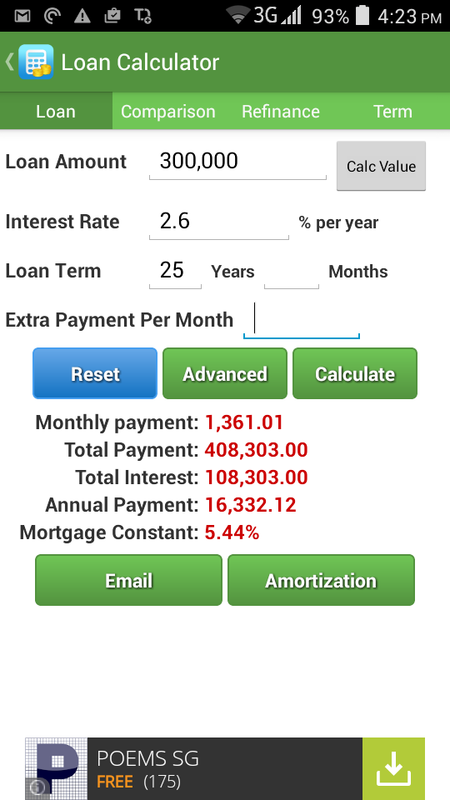 I like the extra payment feature of the loan calculator. Can you share the maker of the app so that I can find it on Google play store? its got a lot more calculators! Hi Kyith, thanks for sharing the app – it is indeed powerful. 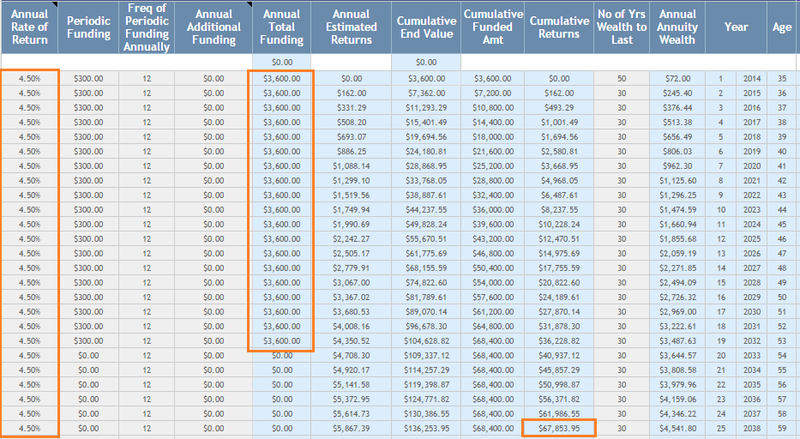 Its Compound Interest Calculator can calculate the extra $1000 over 25 years in CPF OA. why don’t you use it? I use it to calculate my CPF MA for 2014 and the interest is similar to that in my CPF account. – given the marginal difference between interest rates of HDB loan and CPF OA (0.1%), it makes sense to keep money in CPF OA than to repay loan faster, as the return from OA over the years is higher – simply because (1) the base in OA ($1000 every month) is getting larger over time and the loan amount gets decreased over time (2) the marginal difference between the two interest rate. – Is evaluating opportunity cost of repay loan a correct way to judge repay loan faster? Like you mentioned, there are other considerations. Everything has opportunity costs and people do not always use it to evaluate financial options (financial engineering is sometimes too complex). To me, for big commitment like housing loan, I will strive to repay it as early as possible within my means ( to ensure sustainable cash flow and emergency fund), as I intend to look at it as the total cost of the loan (loan amount + interest). I will likely use CPF OA as partial installment and cash for the remainder of installment and additional repayment. I prefer this approach as I trust CPF as a pillar of my retirement fund. the reason is that i have to do it in a few steps cause there are permutations of additional growth without money contribution. yes it is doable but hard to present on a post. i think the main issue i have is i cannot visualize the dollar impact of that 0.1%. to me the 2.6% loan is a magic in compounding as well, albeit in a negative way! so i didn’t think the difference will be that big. but apparently it can get pretty substantial. 3) Fixed monthly OA contribution for whole of 25 years. Interesting discussion. However, I think that the comparison of 57k interest saved vs 88k of interest earned somewhat ignored the fact that the 57k of interest saved represents an asset which is returned earlier, i.e, after 13 years, vs the 88k of cash which is returned after 25 years. Of course, given that we can hardly monetise that 57k asset, cash (even cash stuck in cpf) is still better. Hi irregular, interesting perspective but I felt that u won’t see that 57k only at the end of 25 years because that cash flow is after 13 years realistically. U are saving the future cash flow not the past ones . so its the same situation . Paying off loan using CPF cannot be better off largely because of the accrued interest. The main issue is that even if you pay off your debt, your accrued interest still continues. Most people cannot comprehend this due to the complicated financial calculation. Firstly, Using an extreme example to easily understand this. Assuming you pay off your $300K loan using 100% cpf in lump sum. you start to “owe” cpf 2.5% interest for the rest of the 25 years while the $300K generates no interest for yourself. In another word, you have a new loan with 2.5% interest despite you think you are “debt free”. Secondly, most people are not aware that even their CPF grant is subject to accrued interest. Many HDB owners have $40,000 housing grant, which is credited to their CPF. That means they “owe” the interest to CPF for the $40,000 since day one. The ideal situation is to use cash to pay off the loan while leaving money in CPF to enjoy 2.5% interest for retirement needs. But again this is too much for most people to comprehend. Hey Ivan , that’s a way of looking at it. I like how everyone reasons it differently. A Facebook reader say that u built 2 assets if u don’t pay off. The CPF oa asset accrued interest longer. I felt that its not oweing interest la. Its just that they force u to keep it in this jail longer. We are doing monetary comparison here strictly. Erm… First part – Isnt that Indebted to self? If you are forced to pay the 2.5%, does it still goes back into your OA? 2nd part on housing grant – the capital appreciation of the house over the years should offset that. I have to agree that it’s not just monetary, but whether we are comfortable living with debt and cash in hand, or with no debt but lack cash flow. Humans are not irrational thinkers at all. Maybe we need a fine balance of both. Like what LP has said, put some money back to repay loan, and others put to investment vehicles to generate returns to repay loan. It’s analogous to diversity in investment. Don’t put all eggs in one basket. In that case, if your family’s income capability is not so high i.e. 6k per month per couple, putting 100 or 300 per month in month may provide healthy cash flow and reduce mortgage term, but putting extra 1k per month is too extreme. However Kyith, one thing I wonder is that when we take out the loan, is the total interest payment fixed from the first place? I.e. Even if 10 years later I repay my loan in one lump sum, will the total interest I pay be the same as if I did not repay? I would be applying for a loan next year, so I am curious to know. If it is still the same, then repayment won’t be beneficial. Typo: Humans are not so rational thinkers at all, as we are different in how we are guided by desire for gain (e.g. Returns from investments that we want to maximise mortgage term) and aversion towards loss (e.g. Current and future debt). I think it is more mental than monetary impact. Being debt free asap will make it easier for wife to become stay-at-home mum if she wishes and also make it less fearful when the next economic crisis about to hit us badly. When we are retrenched at our 50s; it is not something young ones in their 20s and 30s can empathize now. What is the price of one thing less to worry in the future? Who know the price of this opportunity cost? You have to evaluate across the board. How much each factor impacts to a person is a function of realistically how well a person knows. You could feel u have safety but your plan is unsound. Hi I have a suggestion to make things more accurate/clearer. The cash outflow would be $2361.01 a month till the 150th month where it is only $1361.01. It is the portion about the interest savings that I want to highlight. As it underestimates the gains from paying off the loan earlier. 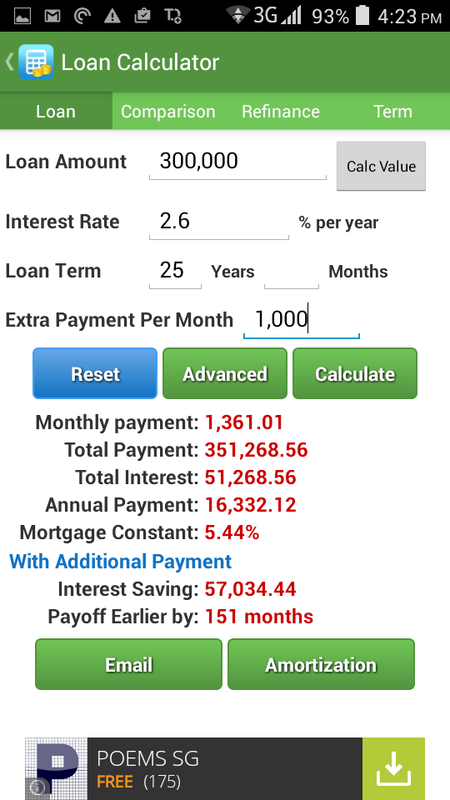 If you paid $2361.01 a month in the mortgage. 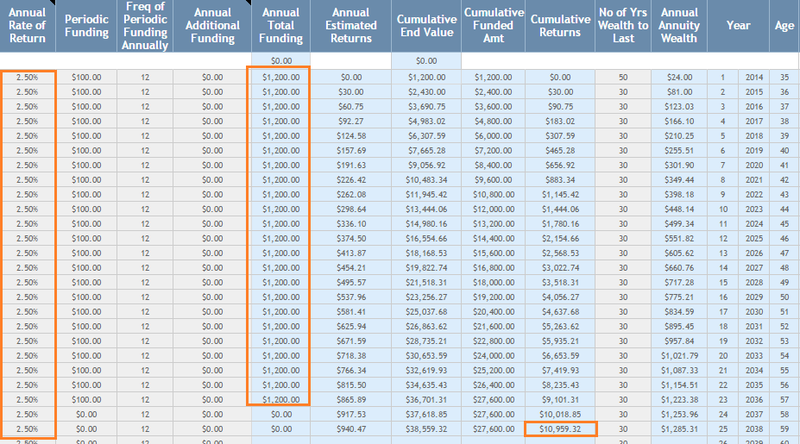 On the 150th month you get to save $1361.01 in your CPF OA account for 2.5% interest a year compounded over 12.5 years. why worried about CPF accrued interest? i think it’s always wise to repay asap using CPF OA but leave 20k or 18 monthly loan as balance in case of retrenchment. Eddy, i think its a concept thingy. if you pay off later, you get to accrual more in your cpf from my calculations. Is FRS really enough for retirement? hi culture_counter, whether it is enough, depends a lot on your expectation of retirement. for me it is not bad. i can cover much necessities based on that. If I have an outstanding housing loan of $500K and I am able to redeem it with my CPF, is it advisable for me to do so or should I continue servicing it through my bank loan, so that I can earn CPF’s 2.5% interest while I pay less than 2% of bank interest? Your advice, please. Thanks. Hi Eric, i believe i can only answer you the monetary part. there are other considerations. your bank loan over the period of service (note not the first three years) are likely to have a lower interest versus the CPF rate of 2.5%. Some would even get higher if they practice the transfer of CPF Oa to CPF SA voluntary. So mathematically it makes sense. As your CPF OA or SA compounds as a lumpsum, instead of you accumulating the money monthly as you work, and cash flow gets added to your cpf oa, the compounding effect is greater. this is only one side of the equation. the plan for yourself could be more than just the mathematical equation. 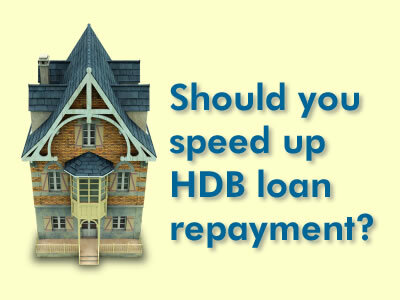 What is your thought about not redeeming the HDB loan while leaving the money in CPF to gain more interest with consideration of minimum sum and age of the borrower? Some advice I get if to leave the money in the CPF to prepare for minimum sum in years to come which to be expected to increase futher? Sorry for the late reply. You always have to balance between the math and the qualitative aspect of the decision. In this article, I show the math is that the money in the CPF compounds over time. So it makes sense to drag out the loan. In this way you build up your wealth in CPF. There is no more minimum sum. That term is replaced by Basic Retirement Sum (BRS) and Full Retirement Sum (FRS). And as you mentioned they are going up. To satisfy the BRS or FRS is not the important and only issue here. the BRS is increasing because inflation is rising and if they do not raise it and it stays at $160,000, when the time comes, most of us do not have enough money in CPF because we spent the money on frivolous things, then is that the right way? Look at the portfolio of property + CPF as a whole. Hi Kyith, I think to compare both options 25 years, for paying more per month option, it’s not fair to exclude the income generation and compounding of those $ free up in in those period after paying the loan. 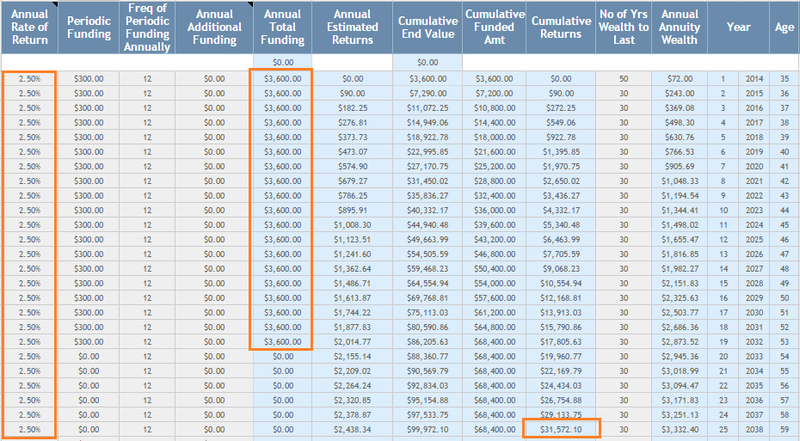 One way of comparison is like assuming the person has a fixed $2361 contribution into CPF OA for 25 years, then calculate for both options what is the accumulated CPF at year 25. Both yields similar return. But CPF OA interest rates increases, then option B will start to outperform due to the larger compounding effect. Hi Choon Lim, thanks for sharing this. I think I need to rethink this. hi bro, im using this app that you used to do some calculations. 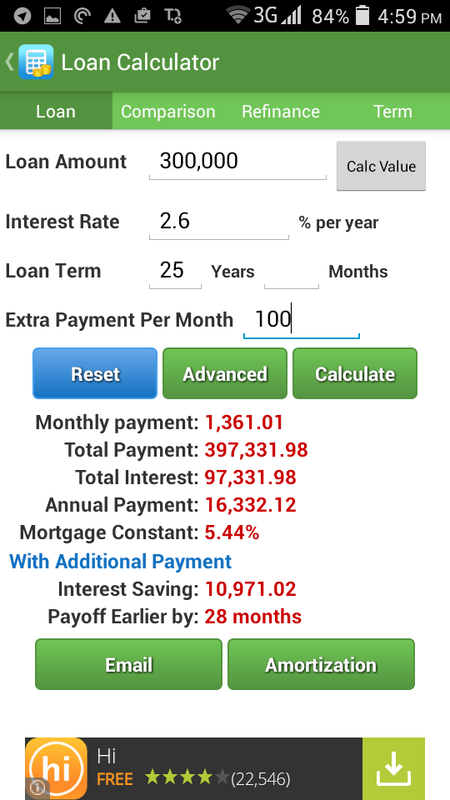 if i take a 300k loan, 2.6%, repayment 10 years. if i take the same loan amt and rate as above but change it to 25 years repayment. mthly , $1,361. using the difference in mthly repayment i do a top up of $1,480/mth. my total interest payable is the same 41k. so m i right to say that it doesnt matter the loan tenure i have took with hdb. as long as i do periodically top up, the interest that i have to pay still work out to be the same. so it will be better to take a longer loan tenure and pay extra as and when you have extra money. rather than take a short loan tenure and face a high mthly repayment. Hi JW, i think there is a difference. Usually bank loans or HDB loans are debt amortization. so if you extend the repayment, the total interest you pay should be higher, unless you borrowed less. usually the early repayment pays off the principal. That reduces your interest payment. however, usually it does not reduce the monthly payout unless you restructure it with them.